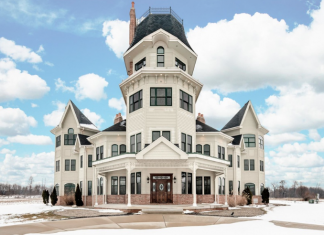 This Victorian style mansion is located at 6445 E Division Road in Mill Creek, Indiana and is situated on 80 acres of land. 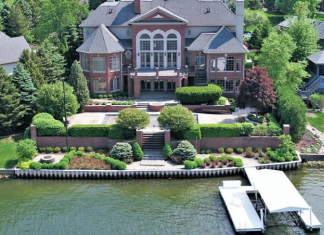 This 13 acre estate is located at 9920 Towne Road in Carmel, Indiana and boasts a main house and building that features an indoor tennis/basketball court. This brick mansion is located at 3434 Club Estates Drive in the Bridgewater Club in Carmel, Indiana and is situated on 2.2 acres of land. This French style brick & stone home is located at 10450 Laurel Ridge Lane in Carmel, Indiana and is situated on 1.4 acres of land. This newly built stone home is located at 640 Kessler Boulevard West Drive in Indianapolis, Indiana and is situated on 3/4 of an acre of land.